A NON STICK PAN IS ESSENTIAL WHEN MAKING THIS DISH, SO YOU ACHIEVE MAXIMUM CRISPINESS AND LOOSE NO PASTA TO THE BOTTOM OF YOUR FRYING PAN. I'VE TEAMED UP WITH ZYLISS TO SAMPLES THEIR SUPER NON STICK PANS WHICH WORK PERFECTLY WHEN MAKING THIS DISH. FOR THE SPICE MIX, SIMPLY MUDDLE THE INGREDIENTS TOGETHER. FORGET THE HEARTY STEWS AND HEAD STRAIGHT TO DESSERT FOR THE BEST WINTER COMFORT DISHES. THIS ISN’T AN OVERLY RICH OPTION AND BY SWAPPING OUT ANY DAIRY IN EXCHANGE FOR ALMOND MILK IT’S LIGHTER BUT JUST AS FLAVOURSOME. THE CARDAMOM WITH BOTH THE THYME AND HONEY MAKES FOR THE PERFECT BALANCED DESSERT. IT TAKES MINIMAL EFFORT TO MAKE, IT’S THE PERFECT DINNER PARTY DESSERT AND WITH IT’S LACK OF DAIRY AND PROCESSED SUGAR MEANS ANY LEFTOVERS CAN DOUBLE UP AS BREAKFAST. GRAVY INSTRUCTIONS | HEAT A GENEROUS GLUG OF OIL AND ADD IN YOUR SLICED ONION AND THYME AND ALLOW TO COOK OVER A MEDIUM HEAT UNTIL SOFT AND STICKY | NEXT ADD IN THE RED WINE, ALLOW TO BOIL THEN ADD IN THE REMAINING INGREDIENTS AND ALLOW TO COOK FOR AT LEAST 20-30 MINUTES UNTIL RICH AND SWEET | ADD IN CORN FLOUR TO THICKEN IF YOU PREFER A THICKER GRAVY. I LOVE TO MIX IT UP AT CHRISTMAS WITH THIS ITALIAN CLASSIC. NO DRY TURKEY HERE, JUST FAIR PORTIONS OF GENEROUSLY STUFFED, SLOW-ROASTED ROLLED PORK, SERVED WITH INSANE CRACKLING. POUR A LITTLE BOILING WATER OVER YOUR PORK SKIN BEFORE PATTING IT DRY AND SPRINKLING WITH SEA SALT FLAKES | PLACE IT IN THE OVEN FOR 20-25 MINUTES UNTIL THE SKIN BEGINS TO TURN GOLDEN | ADD A DRIZZLE OF OIL EVENLY COATING THE SKIN THEN REDUCE THE HEAT TO 160 DEGREES CELSIUS | COVER WITH FOIL AND ROAST FOR AROUND 3.5-HOURS, REMOVING THE FOIL FOR THE LAST 30 MINUTES AND INCREASING THE HEAT TO 200 DEGREES CELSIUS | ONCE COOKED ALLOW TO REST FOR TWENTY MINUTES BEFORE SERVING. 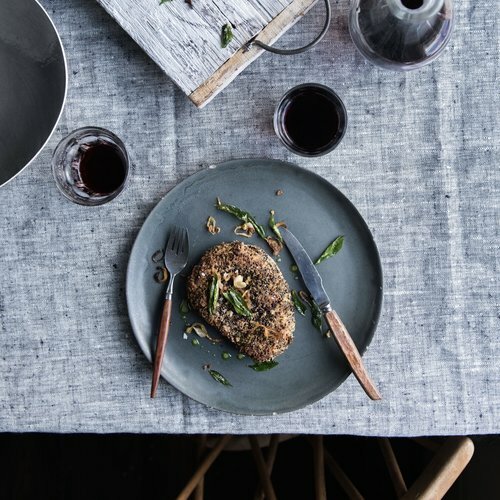 IN A LARGE FRYING PAN ADD YOUR OIL AND HEAT FOR A MINUTE THEN ADD THE TEMPEH STEAK AND FRY FOR A MINUTE OR TWO UNTIL GOLDEN AND CRISP THEN FLIP IT OVER | ONCE GOLDEN ON EACH SIDE PLACE THE STEAKS IN THE OVEN AND COOK FOR A FURTHER 10 – 15 MINUTES ON 180 DEGREES CELSIUS. Upon a recent trip to Lime Wood where we dined in their Angela Hartnett and Luke Holder restaurant, the vegetarian husband scoffed rigatoni with black cabbage, garlic and chilli; a dish so good that it even tempted me away from my saffron and red mullet risotto. So delicious was the rich green sauce the pasta arrived in, I felt I simply had to give it a go and recreate it at home. This sauce works well across a plethora of dishes. Pasta of course is an absolute must try with this beautiful sauce as is my celeriac mash, risotto or as a side to a perfect steak. 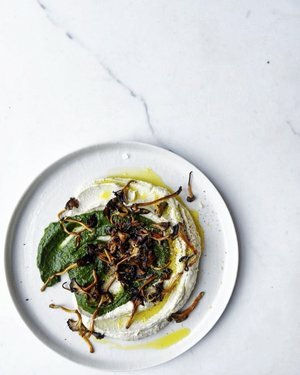 The dark cavolo nero gives this dish an unrivalled earthiness. This is a meal best made for the cold days and long nights that winter brings. PREPARATION TIME: 10 MINS TO MAKE THE DOUGH | 30 MINS TO CHILL | 25 MINS TO COOK THE PASTRY |15 MINS TO PREPARE THE FILLING INGREDIENTS? PREHEAT THE OVEN TO 180˚C | REMOVE THE PASTRY FROM THE FRIDGE AND FILL WITH BAKING BEANS (OR SCREW UP FOIL AND USE TO HELP KEEP THE SHAPE OF THE TART CASE) BAKE FOR 15 MINUTES | REMOVE THE BAKING BEANS (OR FOIL) THEN CONTINUE TO BAKE FOR ANOTHER 5–10 MINUTES UNTIL THE PASTRY IS FULLY COOKED AND STARTING TO TURN GOLDEN | LEAVE THE OVEN ON. A hearty winter dish that will feed the entire family. The combination of fennel and sage gives this dish the most fragrant mix of earthy yet sweet notes. It works brilliantly as a vegan dish too, packed full of flavour with a very similar texture to that of meat and is often a welcome change to classic spaghetti I frequently make! Preheat your oven to 190 degrees Celsius. Heat olive oil in a non-stick frying pan then add in the diced white onion. Cook over a medium to low heat until soft and translucent for around 6-7 minutes then remove from the pan and set to one side. Place your pan back on the hob and increase the heat. Add a good glug of oil and once hot add in the blitzed tofu and allow to turn crisp and golden. Next add in the garlic, fennel seeds, a sprinkle of sea salt flakes, pepper and the fresh herbs fry for a further 2-3 minute then pour in the stock and place in the oven and allow to cook for a further 10-15 minutes, for the flavours to infuse. For the crispy sage leaves, place several generous glugs of olive oil in a small frying pan over a high heat. Once hot (test with one leaf first, it needs to fizz immediately) fry up the sage leaves in batches until darkened and crisp. Drain on paper towel. For the pasta I love to use the steam function of the oven. Place the dry pasta in a pan and cover with boiling water ensuring that the pasta is well covered then transfer to the oven and steamcook for 16-18 minutes or until the pasta is al dente. Remove the pasta by transferring using tongs, placing the pasta straight into the tofu along with a splash of the pasta water and thoroughly combine. Check the seasoning and adjust accordingly. Serve with a generous helping of crispy sage, a god squeeze of lemon plus zest and some finely grated Pecorino or vegan alternative. Tip – If reheating pasta the steam function is a brilliant option, add the 80% humidity and reheat for 2-3 minutes without drying out your meal. 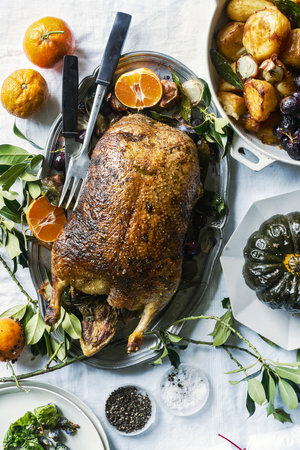 The ultimate way to elevate the classic Sunday roast and indulge! I’m always keen to confit whatever I can get my hands on. Jars of confit garlic, cherry tomatoes and artichokes adorn my shelves so when it came to reworking this Sunday staple I wanted to use this familiar method of cooking. What ensures this dish is cooked to perfection is the addition of steam throughout the cooking process meaning that while the vegetables baste in oil and butter, the chicken’s moisture is retained throughout. Through using the Miele combination oven you won’t forfeit the crispy chicken skin either. Allow your chicken to come to room temperature by removing from the fridge for around 10-15 minutes before cooking. Add your peeled and cut potatoes to a perforated tray and steam at 100 degrees Celsius for 12-15 minutes or until they begin to soften (you don’t want mush). Once steamed give them a gentle shake to bash the edges up a little and allow to rest and dry out for a further 5 minutes. Opt for the combination setting and preheat to 190 degrees Celsius or use the automatic settings for roast chicken. For the chicken combine ¾ of your butter with a little salt and carefully push beneath the skin of the chicken breast. Once evenly covered, place around 5-6 small-medium sage leaves under the skin, arranging so they lay flat. Place a quarter of the sage inside the chicken. Rub a little butter on the outside of the skin, add a sprinkle of sea salt flakes then place the chicken in a large baking tray. Scatter the steamed potatoes around the chicken then drizzle over your olive oil so all potatoes are coated. Season with salt and place in the oven to roast. After 40 minutes turn the potatoes and baste both the chicken and potatoes with the oil, butter and chicken juices. You can now add in the slices of squash too and the remaining sage leaves. Make sure these are also well coated by adding in a little extra oil and large knob of butter too. Roast for another 15-20 minutes depending on how big your chicken is. You can tell when the chicken is done when the juice from the thigh runs clear when pierced. It’s also worth remembering that your chicken will continue to cook when removed from the oven and resting. 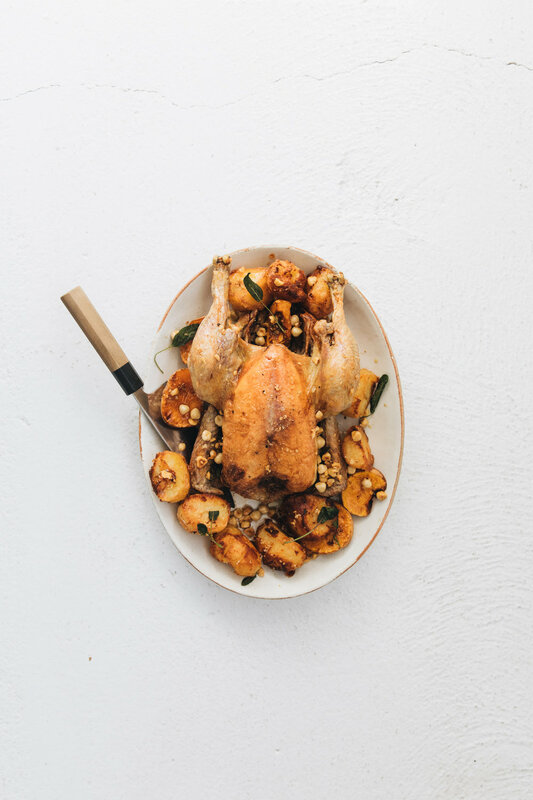 While the chicken continues to roast and the potatoes and squash confit; you can make up your sage and nut butter (this can also be done well in advance). Simply lightly toast your hazelnuts until slightly golden then remove from the heat, bash and rub off skins if necessary then roughly chop. Add your butter to a small frying pan along with the nuts and gently increase the heat, melting the butter and cooking it until it turns a light to mid golden brown. Once made you can pour over the chicken, potatoes and squash, cooking them in the butter for a further 10 minutes or until your potatoes are crisp and golden and the squash segments are soft but crisp round the edges. Remove the chicken and allow to rest (for around 10-15 minutes or longer) and give the potatoes and squash a little extra time should they need them. Make sure you generously coat everything in all the flavoured butter. Finish and serve with a little freshly ground black pepper and zest of half an orange. NEXT WHISK UP ALL DRESSING INGREDIENTS, TASTE AND ADJUST ACIDITY AND SEASONING TO YOUR PREFERENCE. FINALLY COMBINE ALL SALAD INGREDIENTS AND ADD SEASONING | POUR OVER YOUR DRESSING JUST BEFORE SERVING AND FINISH WITH WARM CROUTONS AND SHALLOTS. IN A LARGE SAUCEPAN ADD IN THE SESAME OIL FOLLOWED BY THE CHOPPED SHALLOTS, GINGER AND GARLIC. ALLOW TO SWEAT UNTIL SOFT THEN ADD IN THE COOKED RICE PLUS THE CHOPPED SPRING ONIONS. WHEN YOU’RE ALMOST READY TO SERVE ADD IN THE FRESH PRAWNS AND COOK FOR SEVERAL MINUTES UNTIL THEY TURN PINK AND ARE NO LONGER TRANSLUCENT. SEASON WITH FISH SAUCE USING AS A SUBSTITUTE FOR SALT. COMBINE ALL THE INGREDIENTS EXCEPT FOR THE EGG YOLKS AND SUGAR AND BRING ALMOST TO THE BOIL | THEN REDUCE THE HEAT AND ALLOW TO SIMMER FOR THIRTY MINUTES (THIS WILL BE EVEN TASTIER LEFT TO CHILL OVERNIGHT) | WHISK TOGETHER THE EGG YOLKS AND BROWN SUGAR THEN GRADUALLY ADD A SMALL SPLASH OF THE WARM BUT NOT HOT OR BOILING CREAM MIXTURE, WHISKING THE WHOLE TIME | CONTINUE DOING THIS UNTIL HALF THE CREAM MIXTURE HAS BEEN ADDED THEN TRANSFER THAT MIXTURE BACK INTO THE REST OF CREAM AND CONTINUE TO COOK OVER A MEDIUM TO LOW HEAT UNTIL THE ENTIRE MIXTURE THICKENS A LITTLE | SERVE WARM IN YOUR FAVOURITE GLASSES WITH AN EXTRA SPRINKLE OF CINNAMON. FOR THE GRAVY, HEAT THE OIL, ADD THE ONIONS, ALLOW TO SOFTEN AND TURN GOLDEN, INCREASE THE HEAT AND ADD THE WINE, BRING TO THE BOIL THEN ADD IN THE STOCK, MARMALADE AND THYME, BRING BACK TO THE BOIL AND REDUCE FOR TEN MINUTES THEN SERVE. your biscuits to a fine crumb then add in the dates and blitzed until combined. eggs, whisking again until thoroughly combined. Pour over your biscuit base. Place in the oven and bake for 45 minutes until it has a little wobble to it still. Turn the oven off, open the door slightly and allow to cool in the oven to avoid splitting. Cool completely before removing from the tin. Store in the fridge until ready to serve. Pour sugar into a saucepan, add in 5 tbsp of water and cook over a medium heat until the sugar has dissolved fully. Don’t be tempted to stir or interfere with the sugar at this point. Increase the heat cooking until it turns a caramel colour. Remove from the heat and add in both the cream and butter, stir until you have a caramel consistency. Add in your spices and ginger. Pour over the cheesecake and serve. Preheat the oven to 200 degrees Celsius. Line two baking trays with parchment paper | Place the butter and 150ml of water in a saucepan over a high heat until the butter melts and the water begins to boil. Once boiling immediately add the flour and a pinch of salt, stir vigorously with a wooden spoon until the mixture comes together | Reduce the heat and continue to stir for another minute | When the mixture begins to stick or coat the base of the pan remove from the heat completely and allow to stand for 1 minute | Now gradually add in the whisked eggs, beating the mixture vigorously one more time until it comes together in a glossy dough like consistency | It should still be able to drop off the spoon at this stage | Transfer the mixture to your piping bag and pipe or spoon onto your parchment rounds that are a little bigger than a tablespoon Wet your finger and pat the top of each round so you get a nice round and smooth top to your profiteroles | Allow enough room between each as they’ll grow when baked | Transfer to the middle of the oven and allow to bake for 25-30 minutes or until golden | Once cooked remove from the oven, make a small hole with a knife or scissors in the bottom or side and transfer to a wire rack to cool. For the crème patissière, whisk the egg yolks with the sugar until light and fluffy then stir in the flour | Place the milk and vanilla in a saucepan and bring to the boil | Remove the vanilla pod and reduce the heat to a medium low heat then add in the egg yolk mixture, whisk vigorously and increase the heat a little so it just about comes to the boil and thickens | The trick is to ensure you don’t over cook and scramble the mixture | Pour into a bowl and stir through your cherries, cover with cling film (to prevent a film from forming) cool and then transfer to the fridge until ready to use | When ready to use transfer to a piping bag and pipe into holes made in profiteroles. To make the chocolate kirsch and cherry sauce add the broken chocolate to a bowl and set over a pan of boiling water, allow to melt | In a separate pan combine the cream, kirsch and cherries and warm (don’t bring to the boil) | Once the chocolate has melted simply pour the cream in and whisk until combined and you have a thick glossy sauce (for extra gloss you can add a knob of butter). For the chocolate dipped cherries, simply melt chocolate in a bowl over a pan of boiling water and dip the cherries in the mixture before laying them out on parchment paper | Sprinkle with a little sea salt flakes and allow to cool before transferring to the fridge | Serve the profiteroles piped with the crème patissière, a generous serving of cherry chocolate sauce and a scattering of chocolate dipped salted cherries. Note – You can double this recipe for a seriously impressive stack. 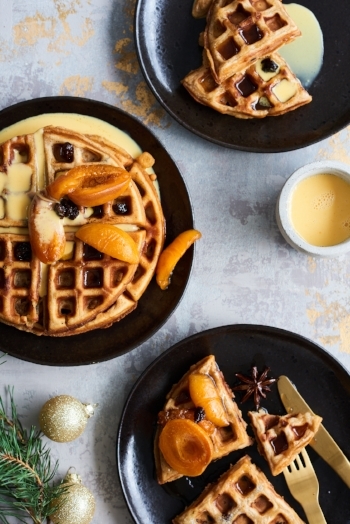 Combine all of the waffle ingredients except the dried fruit in a large mixing bowl until the large lumps have disappeared – be careful to not over stir before finally adding in the chopped fruit. Allow the waffle maker to heat up and give it a generous coating of butter. Add a ladle of the mixture and allow to cook until golden. This should take a couple of minutes or so. Serve while hot or reheat in the oven until crisp. For the drunken apricots combine all of the ingredients except the apricots and bring to the boil before reducing the heat to low. Chop the apricots into thirds or halves and lay them chopped side down in the brandy. Allow to stew for 5 or so minutes until soft then serve. Drizzle over juice from the pan when serving. For the Crème Anglaise combine the cream and vanilla in a saucepan, place over a medium to high heat and bring almost to the boil. Combine the egg yolks and sugar until you have a smooth consistency then pour half of your hot cream mixture into your egg and sugar mixture and whisk vigorously. Pour the combined ingredients back into the pan with the remaining warm cream and continue to whisk to avoid any lumps forming. Continue to cook over a medium heat until the sauce thickens a little. 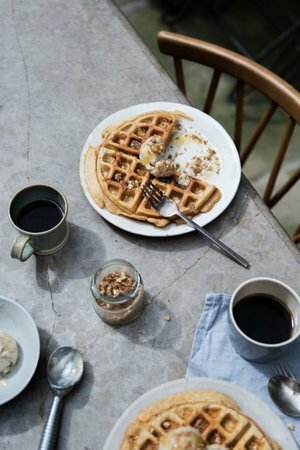 Serve warm poured over the waffles. A favourite rich, dense, sticky spiced bundt cake that never fails to impress guests. This indulgent centrepiece is a brilliant celebration cake and one that can be made several days in advance due to its density and moistness. Baking on the intensive bake function ensures an even and reliable bake with added moisture. Preheat the oven to 180 degrees Celsius on the intensive bake function. Generously grease each bundt tin and set to one side. Combine the butter, treacle and sugar over a medium to low heat cooking until the butter has melted then add in the stem ginger, stem ginger syrup and eggs. Whisk until thoroughly combined. Sift the flour, add the bicarbonate of soda and add in the dried spices. Next pour in the butter, syrup mixture and beat together with a whisk before finally adding in the yogurt . Whisk again until fully combined. Pour the mixture into the mould and bake for around 1-1.10hr or until a knife comes out clean when you slice into the cake. Once it’s cooled a little, turn out of the mould and allow to cool on a wire rack. Don’t add the frosting until the cake has cooled completely. For the frosting first combine the cream cheese with softened butter, whisking until thoroughly combined then add in the icing sugar and whisk again until you have a smooth consistency with no lumps. Add in the zest and generously cover your cake. Lightly toast your coconut flakes until slightly golden and allow to cool before scattering or arranging over the frosting.